Beautiful hands get same attention as a beautiful face. Well at least this is what I feel. Clean, moisturised and soft hands are a must for me. Peeling nails or cuticles can mar ones well groomed image. This does not mean that one should have a polished manicured nails at all times, it is not possible to have a sophisticated nail work for us working women at all times. But, then too the least we can do is moisturise our hands properly. Keeping our hands well groomed does not take much time or money. Here are few points that will help you to treat them with care. • Avoid using harsh soaps when washing your hands as they can cause dry cuticles. • Exfoliate your hands once a week to get rid of dry cuticles. • Keep your cuticles moisturised. • Apply olive oil into your cuticles and nail beds. This will help to seal in moisture and will enable to heal your cuticles faster. • Massage moisturizing hand cream onto your cuticles, and slip on a pair of cotton gloves every night before you go to sleep. • Apply vegetable oil on the finger tips and massage your nails with it. This would help to strengthen them. • Use baking soda to clean your nails and soften cuticles. Dip a nailbrush in baking soda and scrub your nails with it. • Use soaps that have more moisturizing natural ingredients and antibacterial properties. • Get a manicure done once every month to get your dry cuticles removed properly. But as the saying goes that excess of every thing is bad, manicures too can cause damage or even infection to our nails. Women who frequent the nail salon may find themselves left with brittle nails. So limit your visits. • Never use metal or sharp instruments on your cuticles. • Avoid picking your cuticles. Always soak them for 20 minutes, and then use a soft washcloth to push them back. • Always use acetone free nail polish remover. • Never cut your cuticles. • Choose a cuticle cream or oil that contains natural oils such as safflower, almond oil, sweet almond or passion flower. 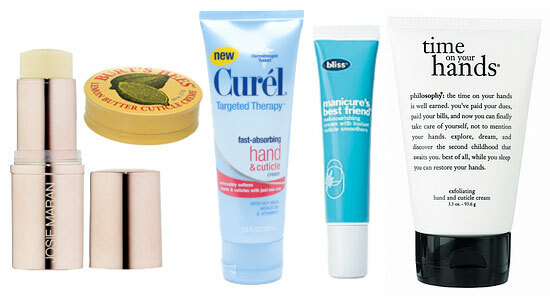 They will heal your cuticles much faster. • Increase the intake of fruits and vegetables to heal the nails from the inside and keep them healthy. Also, include the sufficient amount of vitamin A, iron and calcium in your diet. Now what are you waiting for? Just go ahead and try these tips to keep your hands and cuticles in the best possible shape. @pooja – if there is a whitish cast, and you have this problem post your visit to a salon , it is probably an infection, try using boroline on your cuticles. there is also this anti fungal and anti bacterial cream called Surfaz SN. try it out. it gets rid of infections in a jiffy. @akhila -you can use creams like boro plus on your cuticles and hands. i personally love boroline to death. i know it is sticky, but it does soften your hands. another easy tip is , to take one teaspoon of glycerine and one teaspoon of any vegetable oil, say coconut, olive, sesame, rice . mix it well. and use this to moisturise your hands. This is very useful! I have very dry cuticles, no matter how much I moisturise. I sometimes apply castor oil and tie a plastic bag around and go to sleep! It helps a lot! 😀 .